Image courtesy of Plymouth Housing: Plymouth Housing plans to open its Uptown affordable housing apartment development in 2021. 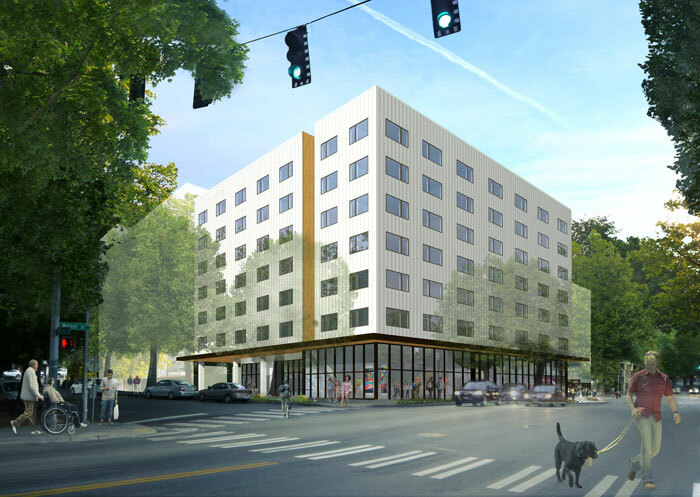 Plymouth Housing and SMR Architects spoke to interested residents Wednesday about what the nonprofit developer does for Seattle’s homeless population and how a new affordable housing development slated to open in Uptown in 2021 will fit in the community. The Mercer Street and Second Avenue North project is just one of five future buildings the nonprofit is planning for Seattle. The five new developments will provide 500 apartments to homeless individuals, mainly seniors and veterans, who qualify for subsidized permanent housing. The Mercer and 2nd Avenue North project will provide more than 90 affordable units for formerly homeless individuals who qualify for permanent housing through Plymouth's programs. There are 12,112 homeless residents in King County. Out of those numbers, 6,320 are unsheltered, 3,585 of those residents are living in emergency shelters and 2,207 residents are living in transitional housing, according to Parham. The average income for homeless residents is $8,775 per year. Ninety-seven percent of the homeless population suffers from a disability, 58 percent live with a mental illness, 58 percent are seniors and 15 percent are veterans. Parham said Plymouth Housing works to be the best neighbor it can since many residents are wary of bringing more vulnerable populations into their neighborhood. The nonprofit does this by providing on-site staff and live-in staff who can respond quickly to emergencies while also providing extra security around the buildings. Parham called this the “eyes-on-the-street" approach. Plymouth Housing also creates mixed-use developments to enhance the neighborhood and street experience. For the Mercer Street development, Plymouth Housing partnered with nonprofit Path With Art to create a unique art and maker space on the ground floor. Path With Art uses art and creativity to help people transitioning out of homelessness. The new space in the Mercer building will include educational space for multidisciplinary art programs, presentation space for galleries or music, a maker's space and administrative offices. Those selected to live in the new apartments will have to pass a list of requirements. Applicants must have lived in permanent supportive housing for at least 18 months, have a recent history of paying rent in a timely matter, not require regular intervention from staff for health and safety reasons, and not have a pattern of unresolved guest issues. The apartments will be furnished studios with wide windows, a small kitchen area and modern furniture. The construction timeline is moving fast for the project. While the nonprofit and SMR Architects are still in the permitting process, they expect to be ready to lease apartments by spring of 2021. The project is going to cost around $30 million and is funded by city and state dollars plus grants and donations. Plymouth plans to have an Early Design Guidance package ready for administrative review later this month, Parham said. The package will be reviewed by the Seattle Department of Construction and Inspections, meaning the city will not hold public meetings to weigh in on the project, but comments can still be submitted through SDCI. Anyone interested in learning more about how Plymouth Housing operates its communities or what the future apartments may look like has two chances to take an information tour at Plymouth Place, 94 Bay St., in Seattle. The first tour will take place noon to 1 p.m. on Wednesday, March 27, and the second from 6:30-7:30 p.m. Thursday, March 28.